For all of us, decorating the Christmas tree has a special meaning- memories from this moment last for years. 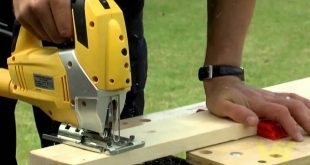 Most of the time you need to move your Christmas tree after you finished decorating it, so in order to also protect it and move it easier, it’s better to slide a large square of cardboard or a round pizza pan under the tree stand. This way you won’t have much trouble sliding the Christmas tree. It’s best to already have in mind the color scheme for this year’s tree. It makes it easier to pick up the lights, the ornaments and it helps organize your ideas as well. If you have some beloved Christmas ornaments that you want to display year after year, take them out from storage, give them a check and fix any problems they may have. It’s nicer to display these ornaments in the more visible areas of your tree since they give you smiles and a happy feeling- after all, this is why you love them so much! Even though you can’t see the entire tree at the same time, try to work round it. Decorate all around to the very edges of the tree to give an equal glow to every angle. For the areas difficult to reach, carefully pull out your tree so you can decorate those parts also. Remember to always begin with the lights, at the base of the tree. Then you work all the way up around the tree. And, don’t go gentle on the lights- the more, the merrier! Your Christmas tree gets more and more defined by using garlands. You can use modern-looking, or more traditional garlands like ribbons, strings of colored popcorn, candy canes or cranberries. Every once in a while, take a step back to get a better view so that you wrap the tree evenly. You can secure the garlands with some floral wire, for instance. When displaying the ornaments, keep in mind the chosen color theme for your tree or create a unique style as you go. Start also from the base of your tree and work up all around the tree. Follow your gut instinct when it comes to the number and the size of the ornaments. The minute you see a gap in your tree, you should cover it with some ornaments or decorations. As before, take a few steps back for a better check on your tree. Now it’s time to cover the base with a tree skirt. You can either go for a festive plaid blanket or an old lace tablecloth- the style of your tree should give you a hint on what to use. Let’s not forget about the tree topper! It should also match your tree’s theme! 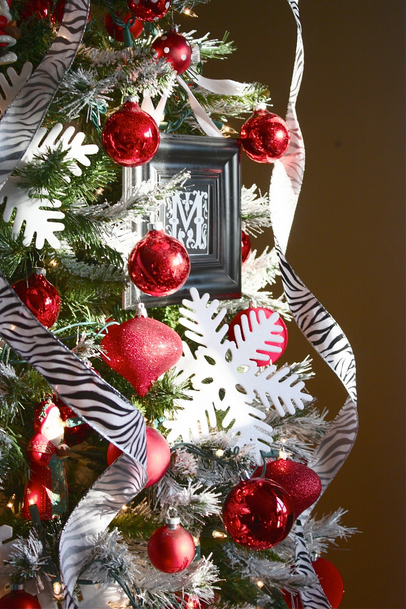 If you decided to go with red and white for your Christmas tree this year, we will have some tips for decorating the tree. 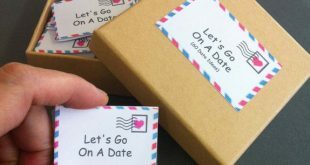 We give you some ideas and you can either go with them or simply take a hint and do the research on your own. It’s your choice! You can start your red& white Christmas tree with these Christmas Tree Lights Decorations, Red and White Décor. They’re not only giving your tree light, but they also are cute decorative ornaments. 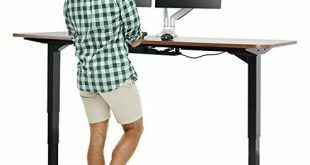 They are battery operated, so you don’t have to worry about the cord that is never long enough to get to the power plug. They need only 3 AA batteries and are energy-efficient. 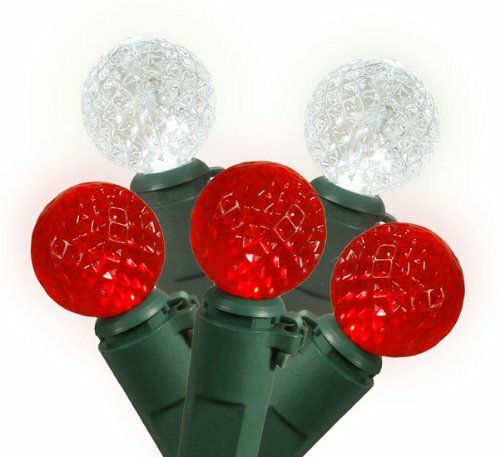 You can also use these lights outdoor since they are waterproof and shatterproof. They also safe around children so kids my touch them even after hours of operation of the lights. These cute 10 lights include a Christmas tree, star, stocking, heart and „Olaf” the snowman as shapes. There is also a refund policy, in case you think they don’t fit your tree’s style. The vibrant red and white of these light are made of hard, smash, weather proof acrylic shell and the wire is 9 ft long. 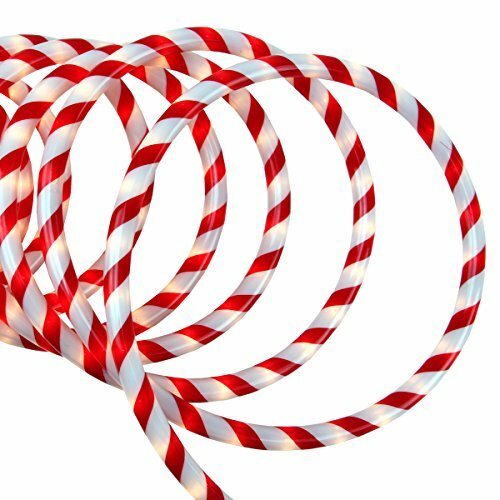 If you want to „old style” for your red&white Christmas tree, but still remain in the 21st Century, try this Red and White Candy Cane Rope Lights. The color of this tube is red and white and the bulb color is clear so your tree will get the red and white color touch that you wanted. The lighted length of this tube is almost 20’ and there is an almost 10” white lead cord. 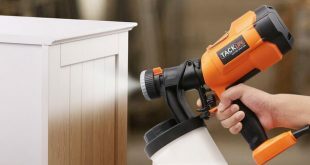 The bulbs give a very bright light and the end connectors with the same opening allow you to connect multiple sets together. This light tube si UL listed and it’s very easy to install. The tube is flexible and it comes also with mounting clips, zip-ties and screws. You may use these lights indoor and outdoor, also. 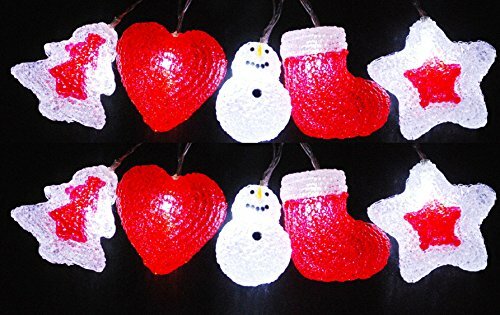 For a cute, fun look on your red&white Christmas tree, go with this Set of 50 Red and White LED Berry Fashion Glow Christmas Lights. The red and pure white bulbs look great on a white flocked tree and quite perfect on a green tree since the wire is green. There are 50 bulbs on a string and the lighted length of the string goes a little bit over 16’. There is a single mold construction to the non-replaceable bulbs. 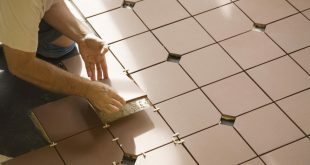 The molding construction prevents moisture from seeping in, thus causinf corrosion. They are LED lights, using 90% less energy and are cool to touch. If any of the super bright bulbs burns out, the rest of the bulbs remain lit. The string contains end-to-end connectors that lets you connect several sets together. Keep it safe though and don’t go over 210 watts. These lights are for indoor/outdoor use and come with replacement fuse. They are water and weather resistant as well. 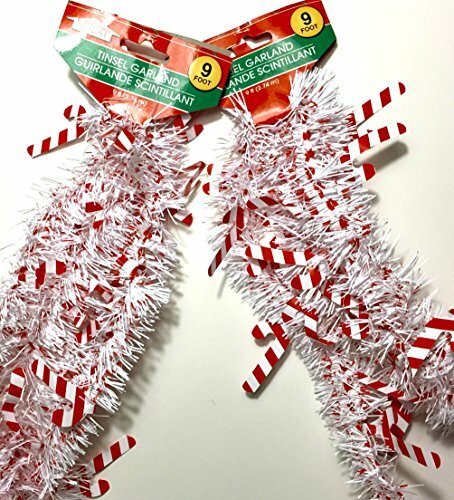 For a classic look on your red&white Christmas tree, you can go with this Christmas White Tinsel Garland with Red and White Candy Canes. As classic tinsel garlands are, the candy canes add sparkle and jazz up your two colored tree this year. This set contains 2 strings, each of them 9’ long. This garland comes gift wrapped also, so keep that in mind when shopping for Christmas and are looking for present ideas. 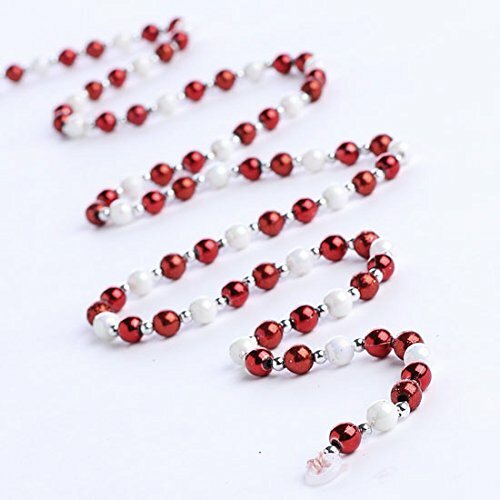 For those of you who like simple, discreet things, this Red and White Bead Garlands might be the perfect ones. The set contains 4 red&white bead garlands, each of them being 3ft long. They give your tree a cute, simple and quite look, just the way you want it. On the other hand, you are a big fan of luxurious, fancy and over the top look, then you found your red and white Christmas garland with this Gold Poinsettia Garland with beaded accents. This is a handcrafted garland, with red flocking and faux golden poinsettia leaves and balls. There are also faux pheasant feathers that embellish this garland beautifully. The garland is made of PVC, polyester, fiber, wire, plastic beads and rayon. It may be displayed also outdoor. Start decorating your red and white Christmas tree with these Shatterproof “Snowflake” Christmas Ball Ornaments. They are shatterproof tree ball ornaments that look pretty and shiny just they would be made of glass, but they bounce back on the floor, just as they are made of plastic. 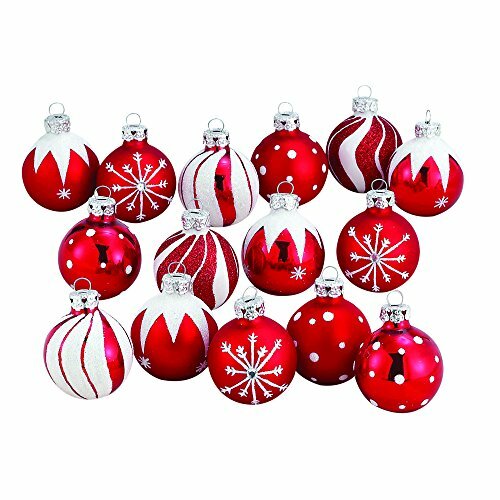 These red and white Christmas balls are child and pet friendly and feature nice shiny red base with white glittery snowflakes. They come in set of 6 pieces, in a reusable slotted gift box (pin that for the presents!). The included ribbon makes things so much easier when giving it as a present. 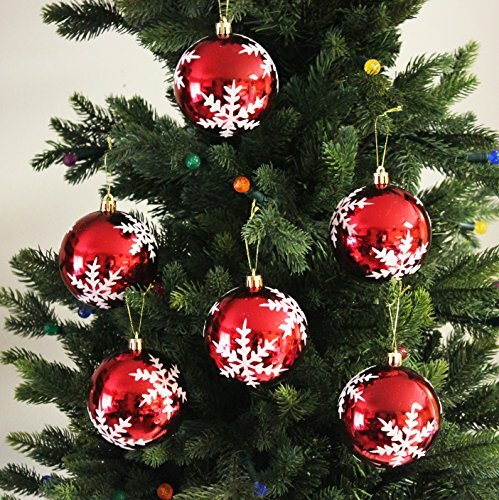 These ball look great in any normal sized tree (5-8ft range). You just need to take the ornaments out of the box since they get to you ready to use with pre-looped strings. 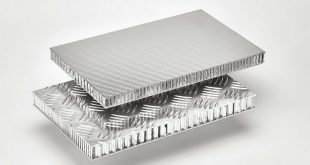 They are very light weight and don’t add weight to your red and white Christmas tree. If you get more than 3 sets, you get a discount. Create a cute red and white Christmas tree with this set of Peppermint Twist Shatterproof White Polka Dot Christmas Ornaments. The set contains 3 red&white peppermint-inspired ornaments. Each ornament has details of red glitter polka dots. They are made of plastic, but sure leave a nice, shiny impression of glass. They come with silver string hangers and there are no hooks included. For a playful red and white look for your Christmas tree, pick this Kurt Adler 1.57-Inch Red/White Decorated Glass Ball Ornament Set. The set contains 15 ornaments, made of glass. So, they give an extra sparkle to your tree, but they require careful handling. The ornaments are beautifully decorated with red and white candy-cane inspired design in a variety of patterns: polka dots, swirls and jagged lines. This is a great set that can both fill in the holes in your red and white Christmas tree, catching anyone’s eyes by their pretty colors and patterns. Pin this when you’re Christmas gift shopping as they come gift wrapped also. If you are on a quest for creating the cute, traditional and classic red and white Christmas tree, then this Kurt Adler Claydough Gingerbread Ornaments are a sure win. 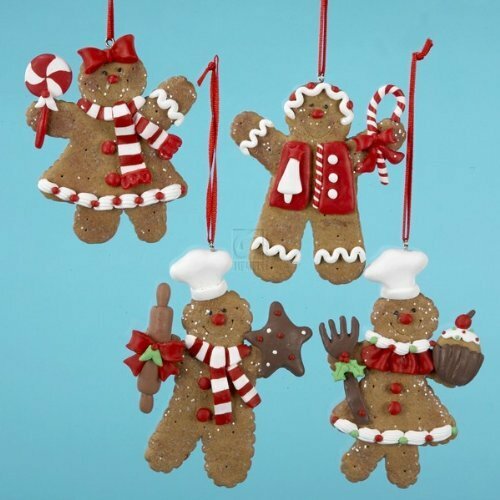 The set contains 4 claydough gingerbread ornaments, having a realistic, sugary look. Each ornament is decorated with red and white icing and two of them even have chocolate detailing as well. There are 2 boys and two girls in this pretty red and white set. The nice colors and vivid, the weight make this a perfect touch when creating a red and white Christmas tree. 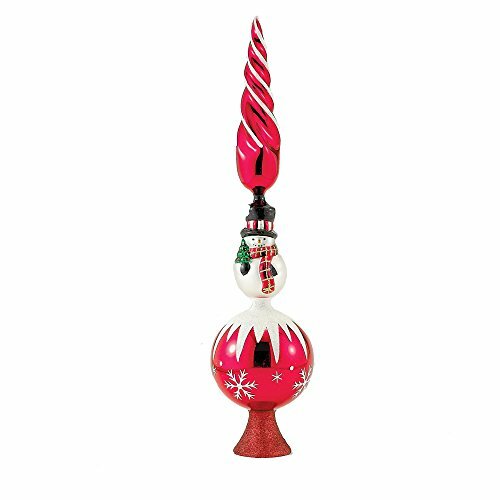 When you feel that your red and white Christmas tree needs a centerpiece, this David Strand Kurt Adler Glass St. Nicholas Snowfall Ornament saves you from the trouble of finding the right piece. Made of glass, this ornament says an entire story by itself. Santa Claus, all dressed up in a long red and white robe, holds a small snow-flocked Christmas tree in his hands. 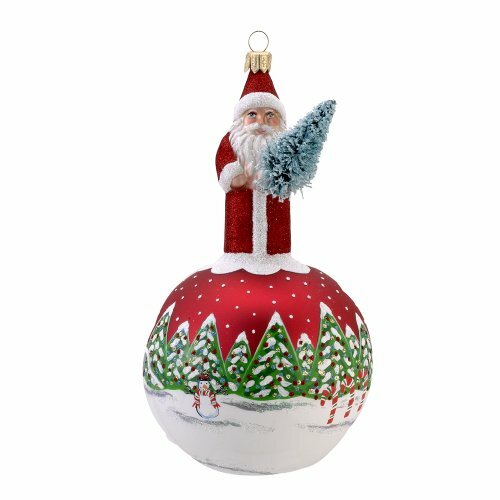 He is standing atop a round red ball ornament, hand painted with a snowy outdoor winter scene. All these are beautifully hand painted and the glass ornament is hand-made by European artisans. The ornament is nicely packaged and ships really fast. You are almost done with your red and white Christmas tree, and all you’re missing is the topper – or you just need to have a new one. Check out this wonderful Christmas Angel Tree Topper. The angel is dressed in a flowing red cloak with white faux fur trim, over a shimmering golden gown. It wears a faux fur hat and holds a green Christmas wreath with holly leaves and red berries. The feathered wings on her back complete its look. 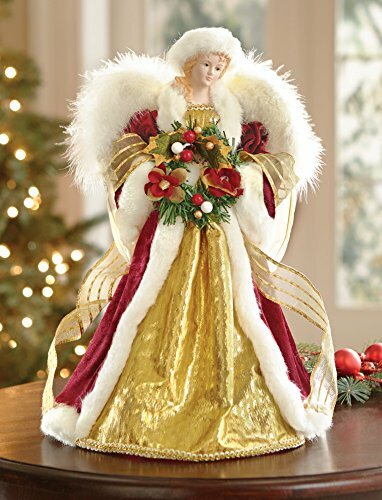 The angel is 16” tall and can be used also as a table centerpiece decoration. If you want to go with a fun, cute treetop, try this Kurt Adler Glass Snowman Treetop. This is a glass tree topper and it gives your tree more glitter and elegance. The snowman is made of glass and 16 inches tall. There is a three-tier design to this tree topper: a round snowflake ball ornament at the bottom, a snowman figure in the middle and a red and white swirled top piece. You’re on the final step now with your red and white Christmas tree. You can go classic with this Red Christmas Snowman Tree Skirt that easily ties around any sized tree. 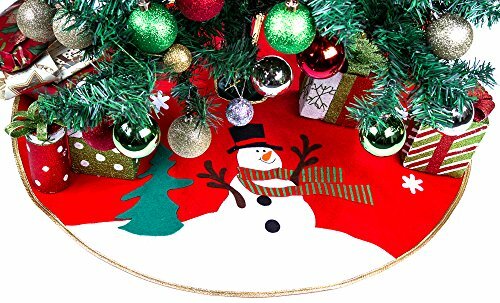 The tree skirt comes in a rich red color, with bright gold border and a happy snowman applique. The cute details simply complete your red and white Christmas tree. 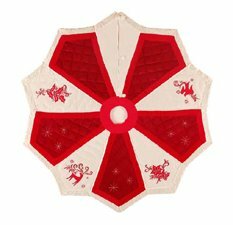 If you want to add the final touch in luxury and timeless style, choose a tree skirt for your tree this Embroidered Quilted Tree SKIRT with Red & White WINTER FROST. You won’t go wrong with this piece that can become a long lasting tree skirt since the handmade high quality is durable over the years. This is a luxurious Christmas tree skirt that fits any tree size. Your red and white Christmas tree may simply become your most beautiful so far with this gorgeous piece of craftsmanship.